Medical assistants provide essential support services in hospitals, medical clinics and doctors' offices throughout the state of North Carolina. Although salaries for medical assisting jobs in North Carolina tend toward the lower end of the pay spectrum for medical services professionals, the expected growth in patient care in the coming years means that demand for skilled medical assistants will nevertheless expand to keep pace. To meet the need for health care support workers in the state, including medical assistants, 5,320 students attended 142 allied health programs in North Carolina in 2013, according to the NC Area Health Education Centers (AHEC) program. Keep reading to learn all about the educational requirements, salaries and job opportunities currently available for medical assistants in North Carolina. Medical assistants are part of an ever-growing support system in the health care industry. They work with patients to ensure their quality of care is sufficient and assist physicians and clinic staff by scheduling appointments and keeping track of patient records. If you’re interested in entering a career in medical assisting, start by doing your research to find a program that fits your needs. 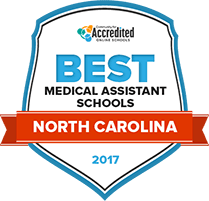 We’ve looked at the numbers and compiled our list of the Top Schools for Medical Assisting in North Carolina in 2017, based on student-to-faculty ratios, career placement services and other factors. Explore the top-ranking schools below. The Associate in Applied Science in Medical Assisting degree at Haywood Community College is accredited by the Commission on Accreditation of Allied Health Education Programs. Orientation to medical assisting, medical terminology, examining room procedures and medical coding billing and insurance are types of classes that instructors teach students who are accepted into the program. Within the 74 to 75 credit program are also general education classes like psychology, computers, general biology and composition. Key degree takeaways include critical thinking, routine laboratory skills and an understanding of ethical and legal issues that apply to patient care. Medical administration, laboratory and clinical applications and functions are major parts of the medical assisting training program at Pitt Community College. Two credentials that students can earn are a certificate and an associate's degree. The certificate can be earned in less than a year. Six semesters are built into the associate's medical assisting degree. Students must generally be 18 years old and have a high school diploma or GED to get accepted the degree program. In all classes, including core, liberal arts and general education courses, students need to maintain a 2.0 GPA or higher to graduate. The Associate of Applied Science in Medical Assisting degree at Piedmont Community College is a multi-faceted academic program. About two dozen required courses make up the curriculum. Administrative office procedures, medical terminology, orientation to medical assisting, laboratory procedures and examining room procedures are some of the courses that students may take. A suggested course sequence schedule is provided by the college. During the final semester, students complete an externship. It's during the externship that students acquire real life, first hand experience assisting licensed medical professionals like doctors and nurses. Graduates should be prepared to take the medical assistant certification exam. Purpose of classes in Wilkes Community College's medical assisting program is to equip adults with medical administration and clinical skills. On the administrative side, instructors prepare students to schedule patient and physician appointments, working with insurance company representatives to get patient bills paid and maintain electronic medical files. On the clinical side, instructors teach students how to perform laboratory procedures and assist doctors and nurses as they perform examinations and other medical procedures. The ability to measure and record patient vital signs and operate effectively in emergency health care delivery settings is another skill that instructors aim to teach students. A growing aging population has increased a need for more skilled medical assistants. Pamlico Community College prepares adults to serve as medical assistants through its diploma medical assisting program. Full-time students can generally finish the program within one year. Medical ethics, laboratory procedures, communicating with patients and their families and insurance billing are areas that students learn about in the associated classes. Outcomes of the program include the ability to draw patient fluids for testing, educate patient on how to take medications and taking patient vital signs like blood pressure and temperature. Southwestern Community College's medical assisting certificate can be completed after earning 13 credits. The program starts with the orientation to medical assisting class. During other classes, students learn about topics that are impacting current medical procedures, facilities, patients and professionals like medical law and ethics, medical terminology and administrative office procedures. The college's medical assisting certificate is taught fully online. Training from the administrative office class aims to teach students how to complete administrative functions like processing billing, filing records and following up on medical procedures. Training during the class also gives students skills to supervise other workers. Richmond Community College's shortest path to medical assisting academic preparation comes through the school's medical assisting certificate. It takes approximately one year to earn the certificate. At the two year level, the college awards the Associate of Applied Science in Medical Assisting. Classes that prepare students to understand and work with medical coding, medical and insurance terminology and patient treatments and exams include anatomy and physiology, medical terminology, drug therapy and medical insurance coding. In addition to working as medical assistants, the training prepares students to enter careers as speech therapists, occupational therapy assistants and a nursing assistant. Through its allied health division, Asheville-Buncombe Technical Community College offers an Associate in Applied Science in Medical Assisting. The Commission on Accreditation of Allied Health Education Programs accredited program teaches students how to retrieve patient records, take vital signs, collect laboratory specimens and explain treatments and how to use medications to patients and their family members. Before graduating, students also learn how to interpret insurance billing paperwork, perform bookkeeping and work with insurance companies, medical facilities and patients to collect overdue payments. Program applications are accepted in person at the Bailey Building. Classes are kept small. Adults who want to work in healthcare, supporting others as they prepare for and recover from treatments and examinations, could enroll in a multi-faceted medical assisting program at South Piedmont Community College. There is the medical assisting and the medical laboratory assistant option. Four areas are emphasized during classes. Among these four areas are billing codes and insurance paperwork processing, medical transcription, medical ethics and regulations and laboratory procedures. Traditional daytime classes are complemented with evening and Saturday classes. New and returning students can apply to enroll in the program online. Students who enroll in the medical assisting diploma at Carteret Community College should be prepared to commit 44 to 45 hours to attending classes. More time is required to finish research and study work. Classes start once a year. The first class takes place during the fall semester. Applications must be submitted by the set deadline. Critical and interpersonal skills, medical billing, patient communication and the ability to perform basic laboratory procedures are among the outcomes associated with the program. People with the medical assisting diploma could also enter careers as medical records technicians or health information technicians. There are dozens of accredited medical assisting educational programs to choose from in North Carolina, offered primarily by community colleges and vocational schools located in all corners of the state. The search tool below is designed to help students quickly locate those medical assisting schools in North Carolina that best suit their individual needs and preferences. How is the term "medical assistant" defined in North Carolina? North Carolina law does not offer a specific definition for the medical assistant occupation. The U.S. Bureau of Labor Statistics, however, provides this short working description of what medical assistants do: "Medical assistants complete administrative and clinical tasks in the offices of physicians, hospitals, and other healthcare facilities. Their duties vary with the location, specialty, and size of the practice." Does North Carolina law offer any guidance regarding the roles and scope of practice of medical assistants working in the state?
" (a) No person shall perform any act constituting the practice of medicine or surgery, as defined in this Article, or any of the branches thereof... (c) The following shall not constitute practicing medicine or surgery as defined in this Article: ... (13) ...This subdivision shall not limit or prevent any physician from delegating to a qualified person any acts, tasks, and functions that are otherwise permitted by law or established by custom..."
Additional guidance regarding the scope of medical assisting practice in the state is provided by the North Carolina Board of Nursing (NCBN), which holds that both licensed nurses (RN and LPN) and physicians can delegate direct patient care to "Unlicensed Assistive Personnel" (including medical assistants), but also makes clear that which professional (nurse or physician) responsible for overseeing the work delegated to the medical assistant must be clearly defined through the use of organizational charts and job descriptions. What all of this means is that the breadth of tasks that a medical assistant in North Carolina may carry out is wide, but those tasks must be strictly overseen by supervising physicians and nurses. North Carolina law does not require medical assistants to be certified in order to practice in the state. Yes. Voluntary certification for medical assisting is both available and highly recommended for anyone seriously pursuing a career as a medical assistant in North Carolina. There are no organizations or agencies that offer certification specifically for medical assistants in North Carolina, but there are a number of national-level certifications available. American Association of Medical Assistants (AAMA) Certified Medical Assistant (CMA) Graduation from an accredited postsecondary medical assisting program; practicum; passing the CMA exam; continuing education for recertification. American Medical Technologists (AMT) Medical Assistant (RMA) Four distinct paths/requirements to qualify for exam; passing the RMA exam; continuing education to maintain certification. National Association for Health Professionals (NAHP) Nationally Registered Certified Medical Assistant (NRCMA) Complete accredited education program, approved military medical training or minimum two years of professional experience; complete NRCMA exam; continuing education for recertification. National Center for Competency Testing (NCCT) Medical Assistant (NCMA)1 Four distinct eligibility routes; passing the NCMA exam; continuing education for recertification. National Healthcareer Association (NHA) Certified Clinical Medical Assistant (CCMA)2 High school diploma or GED; completed accredited training or military or other work experience; passing CCMA exam; continuing education for recertification. None stated by North Carolina law. All national certifications have a base-level high school diploma/GED requirement for candidates, as well as additional education and training requirements as set out in each certifying organization's eligibility rules. Are there tasks outside the scope of medical assistants in North Carolina? North Carolina does not provide a list of specific tasks or activities that medical assistants can or cannot carry out in the treatment of patients. The tasks carried out by a medical assistant must be within the scope of their training and conducted under the supervision of a licensed physician or nurse as described under state law. Salary and wage figures for medical assistants in North Carolina fall closely along the line of those for the nation as a whole according to the U.S. Bureau of Labor Statistics 2014 survey, as seen in this comparison. Considering only state averages for North Carolina salaries and wages can be a bit deceiving. It is also important to consider variations in salaries for specific cities and communities within the state. This table provides a comparison of medical assistant salaries for a number of metropolitan and nonmetropolitan areas throughout North Carolina. Expected job growth in North Carolina for medical assistants over the next several years runs slightly higher than that for the nation at large and significantly higher than for all occupations. The table below offers a comparison of expected trends in medical assistant employment for North Carolina and nationally. Degree and certificate programs in medical assisting are offered on college and vocational school campuses throughout North Carolina, each offering slightly different approaches to curriculum and coursework. Below are the examples of the types of schools and programs currently available in North Carolina for prospective medical assistant students. Two-year community college with six locations in the Ashville metropolitan area currently offering 61 curriculum programs, 55 degrees, 18 diplomas and 56 certificates. Offers both a Medical Assisting diploma and Associate in Applied Science in Medical Assisting degree, although the diploma program is currently not accredited. Located in Concord, Cabarrus College of Health Services offers diploma, associate degree and bachelor degree programs in a number of major subjects including nursing, occupational therapy and medical assisting. Offers both Medical Assistant diploma and Associate of Science in Medical Assistant degree programs, both of which lead to eligibility for AAMA certification. Public, two-year college located in Lexington offering diplomas, certificates and associate degrees on over 50 subjects. Offers three related programs: two-semester Medical Assistant Certificate; two-semester plus summer session Medical Assistant Diploma; and two-year Associate in Applied Science Degree in Medical Assisting. Website of the national agency that accredits medical assisting education programs in North Carolina and throughout the nation. Extensive information on the accrediting process, as well as a search tool for locating accredited medical assisting schools in North Carolina. This organization is dedicated to ensuring there are enough healthcare workers to meet the state's needs now and in the future. Visitors to the site will find information on allied health careers, including medical assistants. Information and resources specifically aimed toward working NCSSMA members opened for access to all visitors. Includes job postings page. Great site for exploring the world of medical assisting education. Includes a variety of search tools including an excellent one for financial aid opportunities. Comprehensive site for information and data regarding the medical assistant profession, with extensive job and salary statistics, job growth predictions, occupation and education descriptions.